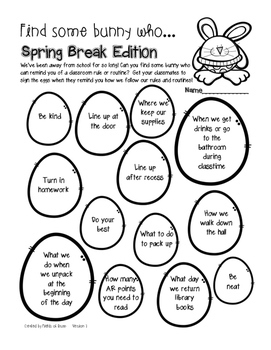 Need a fun way to review classroom rules and routines when your students come back from Spring Break? 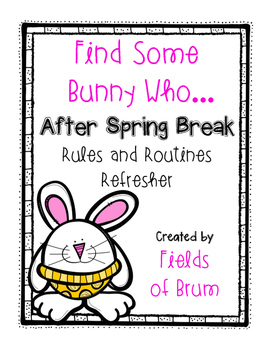 Enjoy this freebie, and have your students play "Find Some Bunny Who..."
All your students need to play is a copy of one of the two versions of the game (pick the one that suits your classroom better) and a pencil. Have your students go around and remind each other how you do things in the classroom. 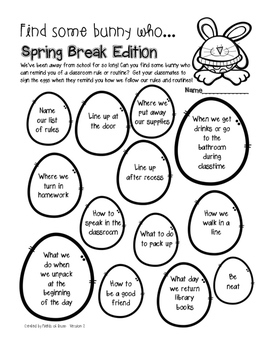 If a student can explain the rule or routine in the Easter egg on a classmate's activity page, he/she signs their name in it. It's easy peasy and tons of fun! Enjoy! Please leave feedback and follow Fields of Brum!